3.5 stars, maybe four - well worth a read. 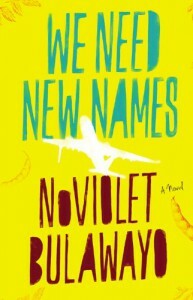 I’m sometimes skeptical of child narrators, but Darling is an effective protagonist; her raw, matter-of-fact depiction of her childhood in Zimbabwe casually contrasts her innocent curiosity and the games she and her friends play with the violence they encounter – death, beatings, sexual abuse, sickness, their own hunger pangs. Yet Bulawayo is clear that Zimbabwe is far more than the sum of its present atrocities; there is history, there is pride, there is home. I loved both sections of this book. My issues were mostly with the writing, which is occasionally too on-the-nose (see, for example, the pretty, bulimic daughter in the Invisible Children T-shirt), as if Bulawayo is making sure she hit a checklist of ironies and brutalities. The multiple shifts in POV in the final chapters seemed unnecessary. While it's a little unfair, the obvious comparison is with Americanah, and I may have been spoiled a bit by just having read that superior novel. Achichie is layered and subtle where Bulawayo is blunt and at times obvious. Both styles work, though, and I look forward to more from Bulawayo. She’s fantastic.